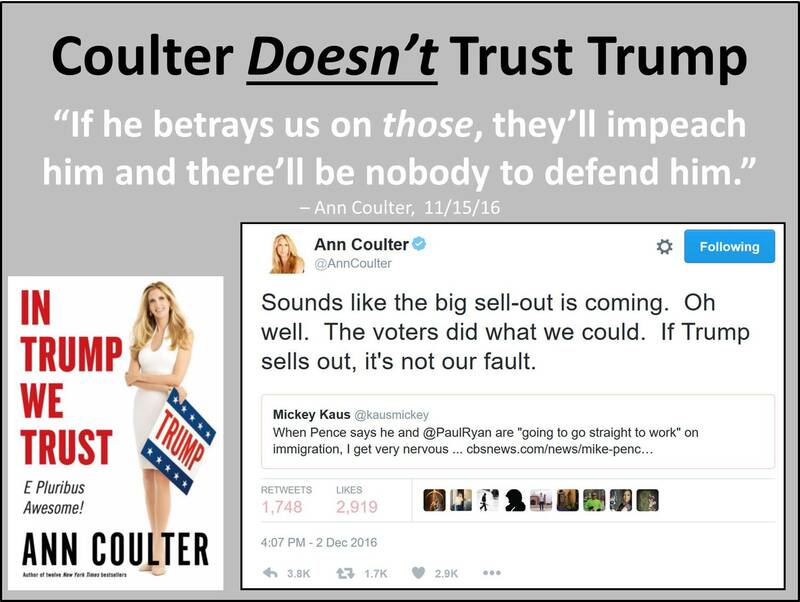 Ann Coulter, the author of In Trump We Trust, doesn’t trust Trump. 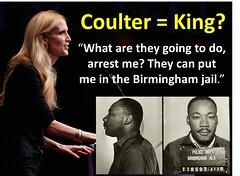 Coulter has always cared about power and always cared about credit. So much so that she has sought power most of her adult life and claimed credit where it is not due. Coulter is an elite’s elite who loves wielding power. Her decades-long pattern of behavior continued with her promotion of Donald Trump (and herself). First, Coulter browbeat the electorate to vote for Trump, insisting he was the only person who could save America. Now, Coulter bullies, cajoles, and threatens Trump to do what she wants done. Let’s remember the context. 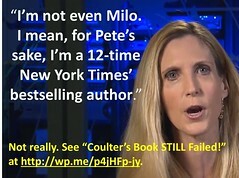 For years, Coulter did the very same thing with Romney. Remember, Coulter was careful to tell Romney that he owed her (personally). Coulter rammed Romney down our throats, promising us that he was the best and would get the job done, all the while warning Romney that he better do that very thing (see Case Study #6, Propaganda: Orwell in the Age of Ann Coulter). But did Coulter ever trust Trump? Hardly. Coulter repeatedly told Trump that he’d better do what he promised her he would do because of all the sacrifices she had made for him. Coulter’s face-slaps frequently include Twitter tirades and jeremiads against the only person in the world who can save America (according to her). Coulter is absolutely terrified that she backed the wrong horse, that Trump will prove as unscrupulous as she is, thus jeopardizing what’s left of her own career. Coulter’s fate is inextricably linked to Trump’s. Can you hear Coulter screaming? In the 1990s, members of Free Republic loved Coulter, called her the “goddess of the conservative movement,” and cherished everything she said and did. That has no longer been true for many years.